I recently spoke to a man who had two terrazzo floors restored. They were both done by different companies. The man wanted shiny terrazzo floors in these homes. He was told he did not want them shiny as this would cause them to be slippery. If a terrazzo restoration company tells you their floors will be slippery if they are taken to a high shine… They are coating or chemically modifying the surface. This is generally done with acids. They may well not know it is not slippery after diamond polishing. Our process takes the floor to three thousand grit. Those scratches are around four microns. This is much smaller than what can be seen with the naked eye. That being said, they are still there. Those small scratches help to make your terrazzo floor non-slippery. 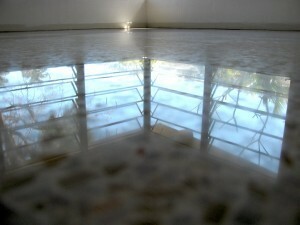 SafeDry diamond polishes terrazzo. Our system involves all diamond grinding and polishing. I have never seen a diamond polished terrazzo floor that was slippery. Granted I work mostly with Portland cement based terrazzo and these floors are old Florida terrazzo floors, so that is what they are. 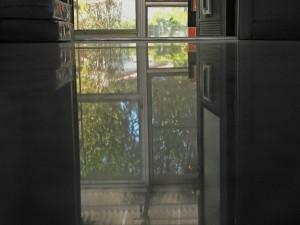 Tests show diamond polished terrazzo flooring is well within OCEA standards, wet or dry. There are a lot of terrazzo restorers in Florida that know little or nothing about what they are trying to do. I tend to believe the people doing these floors were trying to convince this customer he did not want a shiny floor because they could not produce a shiny floor. 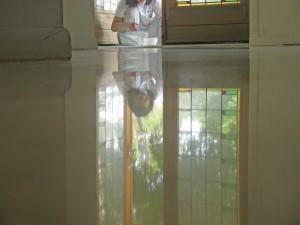 We do not put a topical coating on our terrazzo floors we restore. We also do not do recrystallization on terrazzo floors. 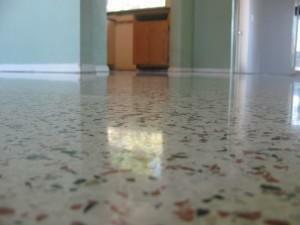 Topical finishes can cause terrazzo floors to be more slippery. If you end up with a shiny terrazzo floor then why put something on top. The floor will not look better. 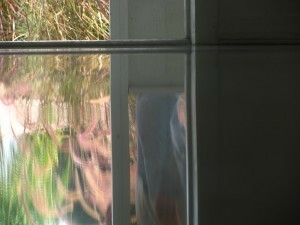 Diamond polishing produces a true, mirror like, reflection that outlast any finish by many many years. Finishes can be glary and yellow over time leaving your floor looking much darker and needing stripped and redone every year or so. Diamond polishing puts more floor on your shoe. That is the main reason the floor is less slippery. 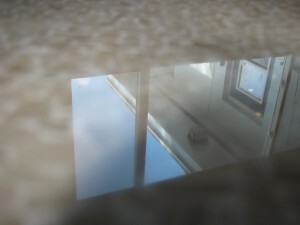 When SafeDry Diamond polishes our goal is the very shiniest floor possible. We have spent a lot of money and time developing a system that takes out the most stains, brings back the original color and gives our customers the shiniest terrazzo floor in our industry. In the past few weeks we have talked to folks who have, in this case, been told they did not want a shiny floor, when they in fact did want that very thing. Another customer who had his floor done and stains worked on and when he was not happy he told the company not to seal it as he was dissatisfied. He paid the tech and left as the tech cleaned up his things. After the customer left the room the tech walked around and poured acid on the floor. This tech was the owner of the company. We restored this floor to look beautiful. It had a low shine, many stains, holes that were improperly filled and deep deep acid burns. Another man had a company restored his floor and they stopped five polishing steps before we do. The result was a low shine and uneven floor. They were clueless as to how to edge as it appeared the did not even try. We do the edges of terrazzo floors with a hand tool. We can also go near the edge with our HTC grinder, but if you do not edge with a hand tool you will fail to get them to look even and shiny. When you consider which terrazzo restoration company you want to hire remember there are many types of terrazzo restoration out there and a lot of the companies lack the knowledge to complete the job properly. In the next couple of years most of these companies will be gone, but in there place will be other companies trying to sell you the same lines. We will still be here, as we have been for many years, doing the very best job we can to produce the shiniest best restored terrazzo possible.